Written Testimony of Karen Hobert Flynn on H.R. 1, the For the People Act. Thank you, Chairman Cummings, for inviting me to testify before the Oversight and Government Reform Committee. And thank you to Chairman Cummings, Ranking Member Jordan, and all Members of the Committee for holding this critically important hearing. My name is Karen Hobert Flynn, and I am the President of Common Cause, a national nonpartisan watchdog organization with 1.2 million supporters and 30 state chapters. For nearly 50 years, Common Cause has been holding power accountable through lobbying, litigation, and grassroots organizing. Common Cause fights to reduce the role of big money in politics, enhance voting rights for all Americans, foster an open, free, and accountable media, strengthen ethics laws to make government more responsive to the people, and stop gerrymandering. Let me start by saying that H.R. 1, the For the People Act, is the biggest, boldest democracy reform package introduced in Congress since the Watergate era. Congressman Sarbanes and many democracy reform leaders in Congress have done incredible work to develop and compile this comprehensive bill that now has 227 cosponsors. I also want to express our appreciation to House Speaker Pelosi for her national leadership on this effort, for making this essential democracy reform package H.R. 1, and for making it the first order of business in the new Congress. Common Cause was founded by John Gardner, a Republican, at a time when Republicans and Democrats worked together on the most pressing issues of the day. During the 1970s, Common Cause worked with many Members of Congress–Democrats and Republicans alike–who put country over party, and we were able to help pass major democracy reforms that sought to correct some of the most egregious abuses of power, including the Federal Election Campaign Act, the presidential public financing system, and the Ethics in Government Act. Shortly after his election in 2016, President Trump promised to remove himself from all of his business operations. Instead, he simply transferred day-to-day control of the businesses to his sons by forming a revocable trust, which meant that, contrary to what he told the American people, he fully retained his financial interests in his businesses and the ability to profit from them, as well as the ability to reassume control. President Trump’s business holdings expose him to unprecedented conflicts of interest. His failure to eliminate his conflicts by divesting himself of his business empire and releasing his income tax returns has struck a serious blow to government accountability. President Trump’s conflicts of interest pose real dangers for the country. The American people have no way to know if decisions made by the President or his administration are being made to benefit the country or to benefit the President’s own personal finances. There is no way for the American people to know if domestic or foreign interests are buying influence and currying favor with President Trump by funneling business to his commercial empire. His conflicts cast doubt on the motives driving presidential decisions, allow him to profit from his office, and quite likely violate the Constitutional ban on emoluments. It is not just the President who is damaging our democratic norms and institutions with his unethical behavior. It is also the people with whom he has surrounded himself. The President’s family exacerbates his ethical problems. While his elder sons run the Trump Organization on his behalf, they expand the net of conflicts around his administration. Meanwhile, his daughter and son-in-law face similar conflicts of interest. In staffing his administration, the President has deepened rather than drained “the swamp.” Many of the officials in his administration are former lobbyists. Time and time again, President Trump ignores their ethical breaches until public pressure becomes intense. On top of this, a rushed vetting and confirmation process has resulted in a cabinet with an unsettling variety of ethics issues of its own. Numerous officials in the Trump administration have been forced to resign under the cloud of scandal or investigations, including former Health and Human Services Secretary Tom Price, former EPA Administrator Scott Pruitt, and former Interior Secretary Ryan Zinke, among others. The unending deluge of scandals that have rocked the first two years of this Administration has been extremely challenging to keep up with, even for those groups like Common Cause that serve as fulltime watchdogs of government ethics. It is impossible for the American people to keep track of the myriad scandals, especially when we have a President who makes false and misleading claims and states untruths on an almost daily basis. President Trump’s lies and false statements have done immense damage to our country and around the world. His lies have undermined our institutions and fueled division and rage. He has undermined the right of citizens to know what their government is doing and to work from a common base of facts. He has subverted our nation’s credibility and effectiveness on the world stage. He has made clear to our allies and adversaries alike that his word can never be trusted. Strong ethics laws, coupled with a strengthened Office of Government Ethics, with independent oversight and investigative tools, can help us combat what has become an incessant assault by the Trump administration on our democratic values and institutions of self-government. These laws won’t eliminate every single conflict of interest, but they can go a long way in preventing conflicts, can help shed sunlight on corruption, and build public support for appropriate action to rein in abuses of public office. Despite significant barriers to advancing reform at the federal level in recent years, Common Cause and many other reform groups have continued to pass significant pro-democracy reforms at the state and local levels on ethics and other critical issues that help empower the voices of all Americans and hold public officials accountable. Just last year, as we outlined in our Democracy on the Ballot report, voters in more than 20 red, blue, and purple states and localities passed pro-voter democracy reforms, with strong support from Republican, Independent, and Democratic voters. This includes voting rights restoration for formerly-incarcerated individuals in Florida, an anti-gerrymandering measure in Utah, independent redistricting commissions in Colorado and Michigan, automatic voter registration in Michigan and Nevada, and an anti-corruption package in Missouri. Additionally, we led the successful campaign in Maryland to pass same-day voter registration. In Ohio, we spearheaded the successful effort to create a bipartisan redistricting commission that passed with support from 75% of voters. We also led a multi-year effort in New Mexico to successfully create an independent ethics commission to oversee state elected officials, lobbyists, and state contractors. It isn’t just through direct democracy ballot initiatives that ethics, voter registration modernization, and money-in-politics reform measures like citizen-funded elections and enhanced disclosure become law. Over the past few years, dozens of democracy reform measures have passed with bipartisan support in state legislatures as well as at the city and county levels. Strengthening ethics and anti-bribery laws are issues that people across the political spectrum believe are critically important to a strong democracy. While certain states are increasingly facing big donors who blockade reform efforts, it is mainly in Washington, D.C., that we see wealthy special interests block progress on democracy reform so that they can continue rigging the rules to benefit their bottom line. Certain critics of H.R. 1, including Senate Majority Leader Mitch McConnell, say that making Election Day a national holiday would be a power grab, and I couldn’t agree more–it would be a power grab for the American people. An Election Day holiday, alongside other registration and voting reforms built into this landmark piece of legislation, would ease current voting restrictions for many Americans and provide for greater turnout and participation. While citizens in this country recognize that elections are important, many voters face significant barriers to voting. Indeed, during the most recent 2018 midterm, field volunteers and reporters across the country noted that in a handful of counties, voters waited in line to vote for more than four hours. The Election Protection hotline, too, received thousands of calls from individuals saying wait times were simply too long and that many had to leave their spots in line so they could return to work. While many states do require employers to provide workers with time off to vote, most do not ensure any more than one to three hours. As we’ve learned time and again during elections, that is simply not enough time to vote. Polls confirm that voters need more time: the majority of Americans cite “inconvenience,” “too busy,” and “not enough time” as their primary reasons for missing elections. With Americans putting more hours into work – not to mention schooling, childcare, and other personal responsibilities – they’re stretched thin as it is. If we want to ensure a favorable experience for voters and help them form the habit of regular participation, this Congress must declare Election Day a national holiday to facilitate the vote. Common Cause strongly supports this common-sense, bipartisan proposal that would enhance government transparency so all Americans can better understand how government works. The measure would strengthen congressional oversight and create a central repository for agency reports submitted to Congress. The portal will also track whether agencies have submitted reports and improve congressional access to all reports. Importantly, the measure will make all congressional reports from federal agencies accessible to the public, easy to search, and downloadable. Americans deserve public officials who are doing the people’s work while in their government positions, not doing favors for past or future employers. Common Cause supports the Executive Branch Conflict of Interest Act, which strengthens “revolving door” restrictions for Executive Branch officials to reduce or eliminate conflicts of interest, so the American people can have confidence that public officials are doing what’s best for our nation and not lining their own pockets or those of their friends. The Executive Branch Conflict of Interest Act prohibits incentive payments from corporations to individuals entering or leaving government service by amending the current statutory prohibition on private sector payment for government work to include bonuses and any other compensation or benefit contingent on accepting a position in government. This Act would further guard against unethical activities by government employees revolving into government service from the private sector or revolving out of government service to the private sector. The Act would prohibit federal employees entering government service from being substantially involved in awarding contracts to, or participating in other government matters regarding, their former employers for two years after leaving the private company. The Act would also prohibit federal employees leaving government service from joining an industry they oversaw for two years after leaving government service (an extension of the current one-year prohibition). And if a waiver is granted exempting any government employee from these provisions, it must be published on the employing agency’s website within 30 days so the public knows that these ethics protections have been waived. For more than forty years, presidents and vice presidents have voluntarily complied with conflict of interest laws and standards of conduct set forth in Executive Order No. 11222. But President Trump has shattered those ethics norms by maintaining ownership of the Trump Organization and doing little or nothing to address the avalanche of conflicts of interest that has resulted. We now know that the democratic norms and values that have guided past presidents are not enough for President Trump and must be supplemented by stronger measures. This sense of Congress resolution makes clear the expectation of the American people that presidents and vice presidents will comply with the same conflicts of interest laws that other public officials must comply with—divesting assets to avoid conflicts and recusing from matters when conflicts exist. This is an important first step, but as noted earlier, we believe H.R. 1 should contain provisions to ensure that presidents and vice presidents eliminate any potential financial conflicts of interest they may have. We believe that it is constitutional for Congress to put conflict of interest policies in place for the president and vice president. We also believe that it is essential to pass a measure requiring the president and the vice president to place all assets that create conflicts of interest into a blind trust managed by an independent trustee who oversees the conversion of assets into conflict-free holdings. Our nation’s conflict of interest and other ethics laws protect us from corrupt, self-enriching, unethical behavior by public officials. Only under very rare circumstances should public officials receive waivers from compliance with these laws—and issuance of such waivers should be a fully transparent process. The White House Ethics Transparency Act secures public access to any ethics waivers issued in the Executive Branch via the Office of Government Ethics website. In its current state, the Office of Government Ethics (OGE) is a paper tiger—well-intentioned but borderline powerless. Congressman Raskin’s bill that was incorporated into H.R. 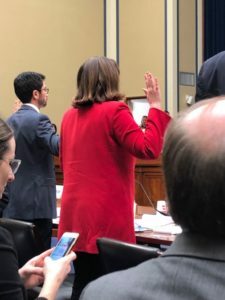 1 gives the Director of the OGE real power, including subpoena power, to implement and enforce our ethics laws, to investigate possible violations, and to discipline those who violate ethics laws. One of the most important provisions of the Executive Branch Ethics Enforcement bill is to ensure that the director of OGE is protected from retaliatory efforts to remove them from office for political or retaliatory reasons. This measure allows the OGE director to be removed only for cause. This is a key component to ensure the integrity of the agency’s independence. This proposal also provides strong investigatory and enforcement provisions, including the ability to investigate allegations of ethics violations and recommend disciplinary action. The director can also issue subpoenas. Only with these kinds of provisions will we have an OGE that can ensure widespread compliance with our ethics laws. Common Cause also recommends that the OGE have budgetary independence, as other independent agencies do, so that they can submit their budget requests directly to Congress. Americans deserve to know whether people nominated to serve in the executive branch have raised money or have benefitted by receiving special interest money from the industries they are supposed to regulate. The political fundraising transparency mandated by this section is the only way that the public can understand who these executive branch staff are working for—the American people or the industries they regulate. There are currently no requirements for presidential appointees to disclose whether they have solicited or contributed funds for political purposes to political action committees, Super PACs, 501(c)(4) social welfare organizations, or 501(c)(6) business associations. Scott Pruitt, the former head of the Environmental Protection Agency who resigned last summer amid many ethics scandals and more than a dozen federal investigations, inquiries, and audits,1 is a perfect example of why we need this transparency measure. It was no secret that Pruitt was hostile to the mission of the agency that he oversaw. Before heading the agency, he had sued the EPA 14 times when he was Attorney General in Oklahoma. Scott Pruitt’s political career leading up to his stint as EPA Administrator was heavily funded by the energy industry. According to the National Institute on Money in Politics, Pruitt received $350,000 from contributions from individuals and political action committees from the energy sector in his 2002 race for state senator, his 2006 race for Lieutenant Governor, and his 2010 and 2014 races for Attorney General. As head of the EPA, Pruitt banned scientists receiving EPA grants from serving on its scientific advisory boards and filled those advisory boards instead with industry officials and lobbyists. The EPA has shed hundreds of employees, many through buyouts, and now has fewer staff “than at any time since the final year of the Reagan administration.” He also packed his calendar with industry meetings and almost entirely avoided meeting with environmental groups, despite the EPA’s mission ostensibly encompassing both camps. Pruitt’s tenure benefitted the energy sector with his track record of delaying, rolling back or repealing more than 22 environmental regulations and his move to lift the limits of measuring what is considered toxic air pollution. Our current conflicts of interest laws leave a big piece of the picture blank because we don’t require high-level executive branch appointees to disclose their political fundraising relationships, thus obscuring from public view the financial entanglements that agency officials have had with special interest groups prior to their government service. Ethical executive branch governance begins during the presidential transition. The Transition Team Ethics Improvement Act requires transparent ethics standards to be adhered to by transition teams, including standards related to security clearances, conflicts of interest, and personal financial disclosure. These standards would be laid out in an “ethics plan” and reviewable by the public via the General Services Administration. Common Cause supports these measures to increase transparency and improve ethics during the transition process. The Ethics in Public Service Act requires incoming members of a new president’s administration to make clear to the public their commitment to ethical governance by signing an “Ethics Pledge” and acknowledging their duty to act ethically when doing the public’s business and after leaving government employment. Such an Ethics Pledge is good step toward setting the right tone—and making expectations clear—for all members of a president’s administration. These provisions of H.R. 1 are common sense measures to ensure enhanced transparency and accountability in our government. These ethics policies described above are desperately needed given the near-daily conflicts and ethical problems of the Trump administration. In Common Cause’s “State of the Swamp” and “Art of the Lie” (co-authored with Democracy 21) reports, we detail the hundreds of ethical challenges and conflicts of interest the Trump administration has had. H.R. 1, however, is about much more than President Trump and his administration. While President Trump and his associates have broken many political and ethical norms (and likely some laws), these could just as easily be broken by future presidents. That’s why we must codify into law key ethical norms and standards that this administration continually ignores. In addition to supporting the portions of H.R. 1 before this Committee today, Common Cause also supports the rest of the For the People Act, and I want to highlight several key components of the bill in particular that fall outside the Committee’s jurisdiction. Citizen-funded elections: Citizen-funded elections help break down barriers to participating in our democracy, creating a government that looks like the people it represents and a government that works in the interest of everyday people. Reforms that provide matching funds to small donations from ordinary Americans help to amplify their voices in the election and enhance their voice in the public policy process. The small donor, matching funds system in H.R. 1 is essential if we are to prevent future influence-buying corruption. These reforms mean ordinary people who are not wealthy or well-connected can obtain resources to run for and win elected office. Candidates receiving matching funds campaign differently, talking to voters about issues rather than focusing on raising large contributions from lobbyists and big donors. As a result, policies and laws are more responsive to public needs and less skewed by wealthy special interests. When I ran Common Cause’s state organization in Connecticut, I led a successful multi-year campaign to pass the Citizens’ Election Program there, and we have seen many jurisdictions across the country introduce and pass citizen-funded elections. These programs at the state and local level have proven successful and popular with candidates of both major political parties. DISCLOSE Act: With hundreds of millions of dollars in secret money spent in elections in recent years, all Americans deserve to know who is trying to influence their voices and their votes. The DISCLOSE Act would ensure there is disclosure of this “dark money” that is flowing into federal elections through non-profit groups and Super PACs, thus improving transparency in elections. The Supreme Court has made clear that such laws are constitutional. Honest Ads Act: Russia has exploited millions of Americans who get their news through social media by posting misleading and sometimes false information online that masks the true identity of the poster. The Honest Ads Act would protect Americans from hostile foreign actors who attempt to manipulate public opinion and meddle in our elections. Voting Rights Advancement Act: After the Supreme Court’s 5-4 decision gutting the Voting Rights Act, Congress failed to even hold a hearing. The For the People Act creates a path for new legislation that will restore and update the Voting Rights Act to protect citizens who continue to suffer targeted and illegitimate methods to deprive them of their ability to vote. If we are to have a true democracy, we must eliminate discrimination at the ballot box. Automatic Voter Registration: Decades ago, many states passed restrictive and discriminatory registration laws to try to disenfranchise voters. In the last few years, 15 states, from Alaska to West Virginia, have created automatic voter registration programs and enabled millions of eligible voters to register to ensure their voices can be heard at the ballot box. Automatic voter registration makes common sense updates so more eligible Americans can register to vote and be able to have their voices heard, while at the same time safeguarding our election system with mandatory audits and better technology, as well as saving taxpayers money. Election Security: After the United States was attacked in the 2016 elections when Russia attempted to manipulate our elections, Congress provided $370 million in election security funding to update voting machines and help secure our elections. While that was a step in the right direction, we desperately need much more. We need a bolder response to counteract continued Russian attacks and potential future attacks by other foreign interests as well. The Election Security Act is a strong response because it would promote post-election risk-limiting audits, voter-verifiable paper ballots, and increased funding for states to improve their voting machines. Independent Redistricting Commissions: Elections are supposed to represent the will of the people, but in many states, partisan politicians manipulate voting maps to keep themselves and their party in power. Politicians should not get to cherry pick their voters; instead, voters must have choices in deciding their elected officials. Independent, citizen-led redistricting commissions remove self-interested politicians from the map-drawing process and give that power to the people. Common Cause led the successful effort to eliminate gerrymandering in California by putting in place an independent citizens’ redistricting commission that operated in a transparent and fair way, with significant public input. Thirty thousand people applied to be citizen commissioners. The Bureau of State Audits, which led the selection process, operating in public view, yielded a diverse group of commissioners, more diverse than the demographics of California. The process led to 34 public hearings; more than 70 deliberation meetings; meetings and hearings in 32 cities and 23 counties; more than 2,700 speakers at hearings; and written submissions of more than 20,000 individuals.8 The process resulted in much fairer districting. Supreme Court Ethics: Justices on the Supreme Court are the only federal judges not bound by the Judicial Code of Conduct. Supreme Court justices are not above the law. Our judicial system depends on public confidence that judges are deciding cases based on law and the evidence, not their personal relationships with lawyers or litigants, or the impact of their rulings on their finances. Supreme Court justices should abide by the same ethics rules as all other federal judges. When Members of Congress are accused of employment discrimination and reach a settlement, taxpayers should not be responsible for paying for this reprehensible behavior. Common Cause fully supports requiring Members of Congress to personally reimburse the Treasury for settlements and awards under the Congressional Accountability Act of 1995. Members of Congress are elected to serve the public interest, not some private, financial interest. We fully support the ban preventing Members of Congress from serving on the boards of for-profit entities. While we think the provisions to strengthen ethics reforms for the judicial and executive branches are quite strong in the For the People Act, we’d like to work with bill sponsors and this committee to strengthen congressional ethics reforms, especially for the Office of Congressional Ethics (OCE), which Common Cause helped create in 2008. Common Cause supports maintaining, strengthening, and expanding the independent Office of Congressional Ethics to provide more accountability for the ethics process that would otherwise be left entirely to Members themselves. History has shown that in a political environment, where relationships are key, that it is extremely difficult for Members of Congress to sit in judgement of each other. The OCE has faced repeated attacks from some Members of Congress. In the first legislative action of 2017, for example, House Republicans moved to strip the office of its independence, which would have gutted its ability to function. Thousands of Americans spoke up, calling and emailing their Members of Congress, which ultimately helped stop this effort to derail the OCE. But the real challenge is that the OCE must be renewed every two years. The American public fully understands that no one should ever be one’s own judge and jury. It’s time to pass legislation to make the OCE permanent and create a similar independent watchdog for the U.S. Senate. Common Cause is aware of the dynamics surrounding the OCE, but we think there is a way to strengthen this important entity and would like to work with interested Members to codify the OCE into law, give it subpoena power, help diversify it, and ensure it receives the necessary resources it needs to succeed. We don’t pass reforms for the sake of passing reform. We pass reforms so that government can be more responsive to the needs of everyday Americans. Some status quo politicians use old, tired arguments to defend the current system by saying it works just fine. They try to hide behind the First Amendment to justify billionaires, corporations, and special interests spending millions of dollars in politics while our children, our families, our schools, and our environment all suffer. Senator McConnell wants to scare us because he knows that, on the merits, he has no good arguments against letting all eligible Americans vote. He essentially admitted that when more people vote, Republicans might not win. Senator McConnell, I have a message for you: the people will win. Maybe not today, maybe not tomorrow, maybe not next week, but we will win. Common Cause has been in this fight for nearly 50 years, and we’ll continue to fight until the voices of all Americans can be heard.